Lois Alexander, a lover of classical music and a Grand Rapids Symphony season subscriber for years, knows well the power of classical music, especially music performed live. “I find it such a peaceful and calming experience,” Alexander said. As a former Resident Services Specialist for Grand Rapids Housing Commission, she also knows it’s an experience that’s not available to everyone, particularly those with financial challenges. That’s what inspired the Grand Rapids Symphony to create Symphony Scorecard, a program to provide free concert tickets to members of the community who receive financial assistance from the State of Michigan or who currently are serving in the U.S. Military on active duty or in the Reserves or the National Guard. Other Grand Rapids Symphony programs created to make it easier to attend concerts include Free for Families, offering a free ticket for a youngster when accompanied by an adult to select concerts; and Student Passport, which gives students a special discount to attend available concerts. 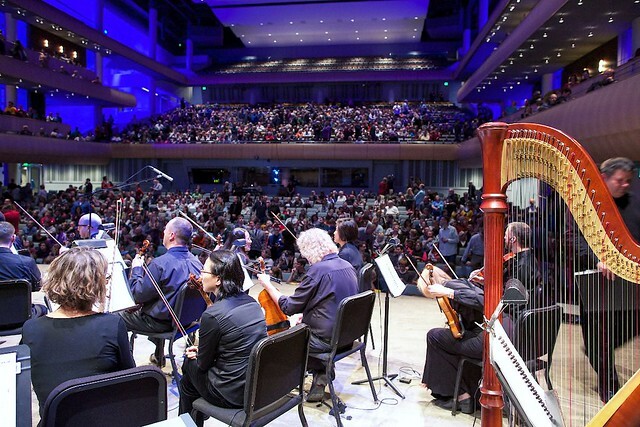 But Symphony Scorecard’s goal is to open the door to those who would like to attend Grand Rapids Symphony concerts but are unable due to financial constraints. Scorecard members are eligible to receive up to four free tickets for most Grand Rapids Symphony concerts. Not four tickets per season, up to four tickets per available concert. Thanks to support from the Daniel and Pamella DeVos Foundation, Symphony Scorecard was launched in September 2015. The initial goal of the pilot program was to distribute 400 tickets in its first season. The response, however, was so overwhelming, by the end of the season more than 2,000 tickets were handed out to residents of Kent, Ottawa and Muskegon counties. “There was much more interest than I had anticipated,” said Mille Russell-Emery, a Community Living Support Supervisor with Thresholds, a non-profit social service agency that provides assistance to Kent County residents with developmental disabilities. As Symphony Scorecard nears the end of its second year, more than 2,300 tickets have been provided this season to concerts in the Grand Rapids Symphony’s Richard and Helen DeVos Classical series, Fox Motors Pops series and Crowe Horwath Great Eras series as well as the DTE Energy Foundation Family series, PNC Lollipops and D&W Fresh Market Picnic Pops. Symphony Scorecard has given participants, such as Artie Smith, an opportunity to lift their spirts through music while sharing the live experience with others. Barbara Neumann, a resident of Mount Mercy Apartments in Grand Rapids, says she has attended “almost all of the concerts” since getting a Scorecard and has encouraged several friends living in the community for older and disabled adults to join her. She says they almost always have the same reaction. “We never knew this music was so exciting,” Neumann said. Myra Lilly-Gillespie, a resident at Ransom Towers in downtown Grand Rapids, was a friend who was invited by others to join them at concerts by using Symphony Scorecard. “The benefits of living in Grand Rapids and having the symphony that we do is quite a gift,” she said. Soon, Lilly-Gillespie brought a guest of her own. Erin Shibley, a resident services specialist at Adams Park Apartments with the Grand Rapids Housing Commission, said residents there tell a similar story. “They come back, and they’re just in awe of how it makes you feel,” Shibley said. Residents in the adult foster care system and in group homes are especially enthusiastic about the experience, according to Colene Johnson, Community Resource Coordinator with the Department of Health and Human Services. “When they call me and ask for a Scorecard, they’re very excited and can’t wait to get it,” Johnson said. For people with limited resources, going to concerts typically is beyond their means. At Thresholds, residents in its network of 20 living facilities might receive $40 to $60 a month, according to Russell-Emery. Symphony Scorecard offers an opportunity for vulnerable families in financial crisis or other difficulty to share experiences that not only enrich their lives but lighten their loads. One client at Baxter Community Center in Grand Rapids grew up listening to her father play the cello. Thanks to Symphony Scorecard, she was able to take her father to a concert, which otherwise would have been beyond her ability to afford. But most Symphony Scorecard users from Baxter Community Center are families with children, said Susie Kim-VanderGriend, Epic Family Coach at the center. “The Grand Rapids Symphony Scorecard program has allowed these families to be able to take an afternoon out to go see a Lollipop concert, or they can take their young kids and start introducing music to them at an early age,” she said. Scorecard has exposed members of the Native American community to music and culture other than their own, said Angelo Franchi, Native American Outreach Specialist with the Michigan State Department of Health and Human Services office in Kent County. Though limited resources may be less of an issue for members of the U.S. Military, a greater concern for servicemen and women is family life when a member is deployed far from home. . When a family member is away from home for months, it’s important that they have support at home, and experiencing live music, surrounded by others, is a comfort in emotionally trying times. Scorecard is a big help, said Gunnery Sgt. Teodulfo Nunez of the U.S. Marine Corps Recruiting Office in Grand Rapids. Since the debut of Symphony Scorecard, Manuel Ortiz, an assistant unit supervisor at a group home with Bethany Christian Services, has begun bringing larger groups of teenagers to concerts, sometimes two and even three times a month. Few of them have been in a concert hall or heard a live orchestra perform, and it’s not uncommon that the experience affects them in lasting ways. Another recent Grand Rapids Symphony initiative is its Music for Health program, which sends musicians into area hospitals to work with patients recovering from trauma as well as to comfort patients and providers, as well as family and friends, with live music. Though Scorecard isn’t directly connected, it’s meeting a similar need. Bette Wiley, a resident at Ransom Towers, was in a car accident several years ago. Afterward, she had difficulty reading and coping with hearing and sensory issues. Experiencing live music regularly, thanks to Symphony Scorecard, has helped her recovery, Wiley said. Cherry Health, which serves more than 60,000 patients at 20 locations throughout Michigan, hands out Scorecards as rewards to clients who fulfill goals such as having yearly checkups or losing weight. Russell-Emery, who has an autistic son of her own, agreed. “There isn’t an opportunity like this anywhere else,” Russell-Emery said.